While President Obama and Chinese President Xi Jinping were at the White House discussing serious subjects like cybersecurity, First Lady Michelle Obama and Chinese First Lady Peng Liyuan took on a much more lighthearted task: naming America's new panda cub. The two first ladies on Friday traveled to the Smithsonian's National Zoo in Washington, D.C., where the cub was born on August 22. Standing in front of the panda exhibit, they unfurled scrolls to reveal the name, written in both English and Mandarin Chinese: Bei Bei. The name translates to "precious treasure." 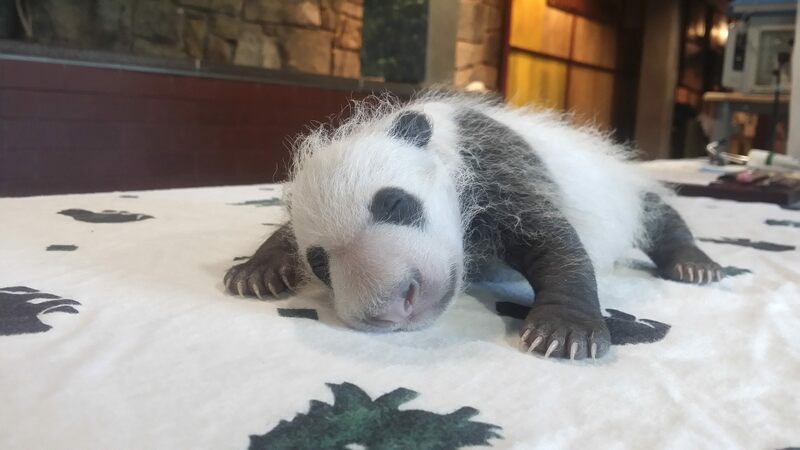 Zoo director Dennis Kelly said the two first ladies selected the name from suggestions proposed by zookeepers at both the National Zoo and China's Wolong Nature Reserve. Peng, speaking with a translator, called Bei Bei's birth "yet another success in a conservation cooperation between China and the United States on giant pandas." "I am delighted to learn that the American public has great affection towards the giant pandas," she added, observing how Washington Metro fare cards feature a picture of a panda munching on bamboo. "I truly hope to own some of these fare cards as a souvenir," she said to laughter. Mrs. Obama called the zoo a "national treasure," adding that her daughter Malia has had "several internships" there and often visits "under cover." Before the ceremony, children from the Washington Yu Ying Public Charter School sang two songs in Mandarin Chinese to the first ladies. Mrs. Obama told the children, "We want young people like you to be global citizens." She noted that President Obama and President Xi that day announced the One Million Strong initiative to teach one million students here in the U.S. to speak Mandarin Chinese by the year 2020. "You're the best ambassadors that we have, not just right now, but for decades to come," Mrs. Obama said to the children.